In today’s Wall Street Journal I review two utterly dissimilar shows, the musical version of Sylvester Stallone’s Rocky and Will Eno’s The Open House. Here’s an excerpt. “Rocky,” a no-budget quickie that grossed a $225 million, won the best-picture Oscar and spawned five sequels, has become a big-budget Broadway musical with a score by Lynn Ahrens and Stephen Flaherty (“Ragtime”) and a book co-written by Mr. Stallone and Thomas Meehan (“Annie,” “The Producers”). That’s a high-toned pedigree, especially for a musical based on a movie that the cognoscenti long ago wrote off as a lowbrow joke. Let’s start, then, by stipulating that the film is excellent of its kind, a juicy cinematic cheesesteak that does exactly what it sets out to do. Pauline Kael got “Rocky” right when she deigned to admit that “its naïve, emotional shamelessness is funny and engaging.” (John Simon liked it, too!) What’s more, the stage version, directed with immense panache and soaring physicality by Alex Timbers (“Bloody Bloody Andrew Jackson”), is very nearly as good, an unpretentious slice of honest entertainment whose rock-’em-sock-’em finale will set the snobbiest of theatergoers to cheering in spite of themselves. In the manner of most screen-to-stage musical-comedy adaptations, “Rocky” sticks closely, at times slavishly, to the source, with the best lines from Mr. Stallone’s screenplay incorporated more or less verbatim into the book (“I’ll carry him for a couple of rounds and then drop him in the third like a bad habit”). Likewise Andy Karl, the star, who does a baldly straightforward Stallone impersonation. 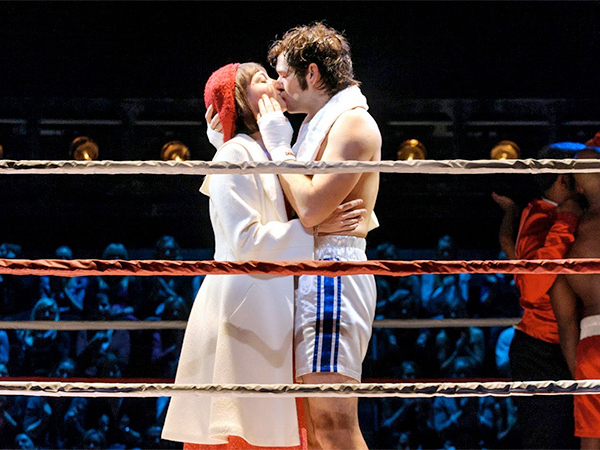 (Not so Margo Seibert, a superior singer who succeeds in finding her own way into the character of Adrian, Rocky’s plain-Jane neighborhood girlfriend, who was played so well in the film by Talia Shire.) Here, though, that’s not a complaint, for the faithfulness of the adaptation is also the source of its strength: Like the film, it gives you lots of what you want. Will Eno is a hot young playwright who’s getting hotter: He’ll be making his Broadway debut in April with “The Realistic Joneses.” In the meantime, Signature Theater is putting on his latest play, “The Open House,” in which Mr. Eno’s surreal style of serious comedy fails to seal the deal. The setting is a nondescript suburban home ruled by a wheelchair-bound monster of sarcasm (Peter Friedman) whose wife, grown children and widowed brother (Carolyn McCormick, Hannah Bos, Danny McCarthy and Michael Countryman) have all been cowed by his snarling contempt. Midway through the show, they quit the stage one by one and are replaced by strangers (played by the same actors) with totally different personalities. It’s a promising premise, but onstage “The Open House” comes off like a cross between a variety-show sketch and a “Twilight Zone” episode…. 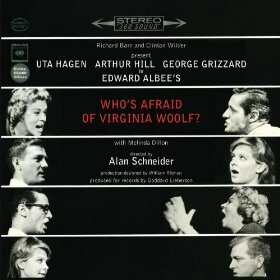 In today’s Wall Street Journal “Sightings” column I write about the “original-cast” albums of two modern masterpieces, Edward Albee’s Who’s Afraid of Virginia Woolf? and Benjamin Britten’s War Requiem. Here’s an excerpt. And what’s it like? Astonishing. All four actors plunge into their roles with caustic, unsparing ferocity. Naturally it would have been wonderful if their performances had been filmed, but you don’t have to see Ms. Hagen and Mr. Hill clawing drunkenly at one another to be staggered by their black desperation. Merely to hear them is to know how great they were. The same thing is true of “creator recordings,” classical-music recordings made by some or all of the artists who gave the premiere of a piece. It even holds true when the composer is also one of the performers….